New replacement Seat Pivot for Mirra® chai..
New Mirra® Roller Mechanism. ..
New Mirra 2 Seat Pan Assembly. ..
New Mirra® Fixed Front Seat Assembly. 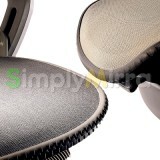 Inclu..
New Mirra® Flex Front Seat Assembly. Includ..